We have studied with many teachers in a variety of styles over the years – including Iyengar and the Viniyoga of Desikachar. The teaching is a synthesis of all that we have studied for 25 years and what has evolved during years of practice. Our teaching guides a student to be self-referenced through attention to the breath, sensations of the body and whatever arises in every moment. It is a process of letting go, or “undoing”. We see yoga as an inquiry: listening, trusting and surrendering to the body. Ultimately it is about being, rather than doing. In some instances, there might be a focus on physically challenging postures and other times it will be more “yin” – a more subtle approach. It is not just a “workout’ and it is not all “very quiet work” – it can change depending on the needs of the individuals and the group. There are times when the postures will flow from one to another with the breath and times when a posture might be held for a time – but always with attention to the breath and the sensations throughout the body. The particular style or the outer appearance of the posture is not of primary importance. The focus is inward – listening to the body and breath in each pose. By developing awareness of the breath and sensations in the body, each person adapts and adjusts the pose to suit the needs of their body in each moment, which is always changing. The pose develops from within, not imposed by a concept of how it should be. We help students develop a meditative awareness in the yoga postures that allows them to deepen their self-awareness. This has profound benefits long after we have left the yoga hall. 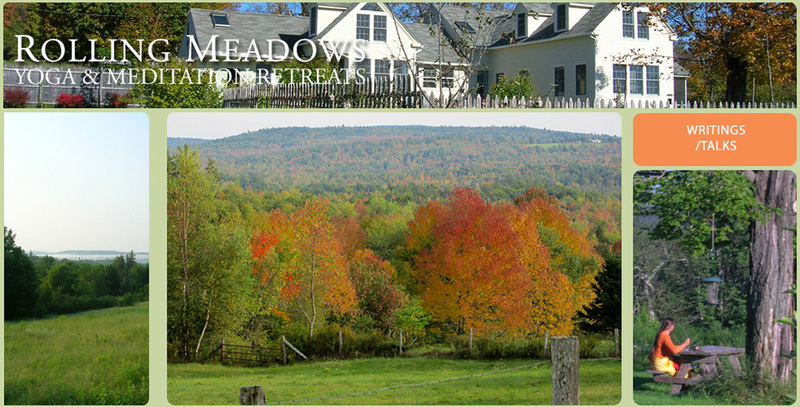 These retreats are suitable for anyone, regardless of age, physical ability or prior experience in yoga and meditation. The teaching is primarily guiding each participant back to their own intuitive knowing. Students come to these retreats for different reasons and with different backgrounds. The retreat experience is unique for everyone, allowing them to have the understanding and experience they need at that particular time. Of course, there is a great deal of variation even within the various styles of yoga. Perhaps as important as the style of yoga is the teacher’s intention and understanding of how they would like to see a student benefit from a yoga retreat. The following short writing about “the nature of retreat” is a brief expression of our intention for retreat. The Yoga Retreats are an opportunity for one to relax and rest in the natural presence/awareness that they are. We feel this is the essence of yoga, meditation, and retreat in general. The schedule, teaching, and environment allow one to let go of the demands and details of daily life and to reconnect with and reveal their own deeper knowing. Yoga postures, breath awareness, restorative postures, meditation, silence, and free time in the natural world generally assist in this letting go. As we let go of tension and the busy mind, a deeper knowing that is always present, reveals itself. There is ample opportunity for people to ask questions of during the sessions or in private interviews between sessions. The morning after arrival we begin what we call “social silence”, meaning silence between the sessions which ends the last morning of the retreat. We have found this greatly enhances the benefits of the retreat.